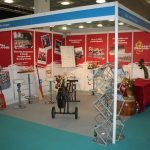 On Monday 7th November 2016 Race the Dragon set of for Liverpool to build our stand at the PAExpo held at the Exhibition Centre Liverpool, we arrived in time for our allotted slot but due to unforeseen circumstances this was put back, we didn’t let this phase us but it was becoming apparent the later it became that an early start on the 8th (show day) was on the cards. 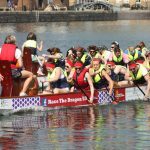 On the 8th Race the Dragon were the first people onsite wanting to beat the crowds, get our stand built whilst having time to do this to the high standards we set ourselves! All of this was achieved and we still had time to go and get a cooked breakfast, all in all a good morning even if it was a bit chilly! 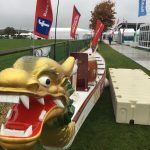 The show opened at 1030 and it was game faces on, we love sharing what we do with others and our passion for the sport of dragon boating, events, festivals and youth development shines through, we met lots of interesting people who we engaged with all with their own individual take on Dragon boating. We normally try to include one of our amazing Dragons heads and again we did not fail! Lots of people were visiting our stand and this was one of the big eye catchers, as you can see here with Charlotte from PA life getting in on the action with a picture. At the end of the first day we shot of to get ourselves some lunch/dinner before heading over to the after show networking party, lots of stories were going around from everyone about their experiences from the season just gone and the show itself, fun and laughter was had by all. We met the lovely Bec’s from “the Funky Sunflower” who was as always friendly, bubbly fun and professional, she had a very pretty stand with the Magician David Burgess at the front of it keeping us all entertained with his astonishing magic from card tricks, printing a business card to mind reading! We also met Andy from “Good Travel Management” another great personality who is also a photographer, bit late now as I am already married but I would recommend him if you need one, I think he could get you places also maybe even to one of Bec’s fabulously themed venues! All of these great characters next door to each other, I think we should have moved our stand! 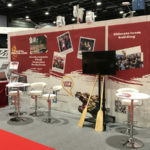 On Wednesday 9th we did not have an early start which was greeted greatly by all so a relaxing wake up, cooked breakfast and then a walk round to the exhibition centre. On arrival you could see a few that had enjoyed the networking party maybe a little too much, but none the least everyone was ready for day two. Day two was quieter than the previous day which can quite often be the case with many shows but we took the opportunity again to network with the exhibitors in more detail, at four o’clock the show was closed and we had a very good and quick take down of the stand, we had managed to be loaded and gone much earlier than we anticipated and we were off…. Only to then get down the M6 and bump into an hour and forty minutes of traffic! Not the plan that we had in mind but as always we took this in our stride. 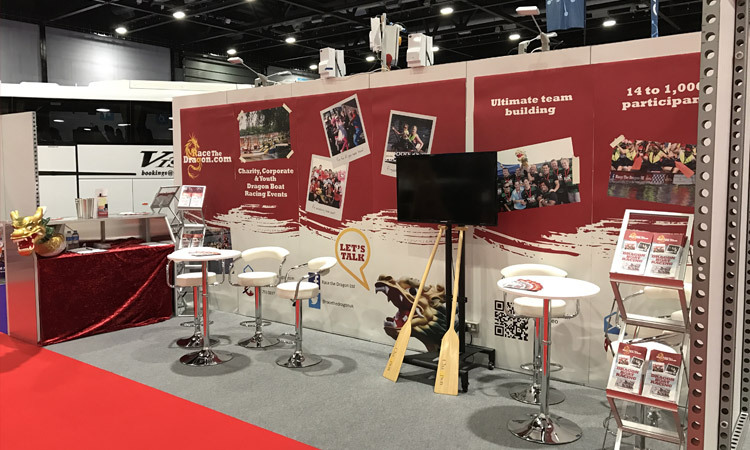 On our stand we did have a competition running across the two days, this was a chance to win a bottle of Champagne and a team entry in one of our 2017 Festivals local to you, it doesn’t get much better than this with a value of more than £530.00 for just placing your business cards in our Champagne bottle. We are pleased to announce that the winner is Laura from Leeds United, we will be in touch shortly and look forward to seeing you at a 2017 Festival.